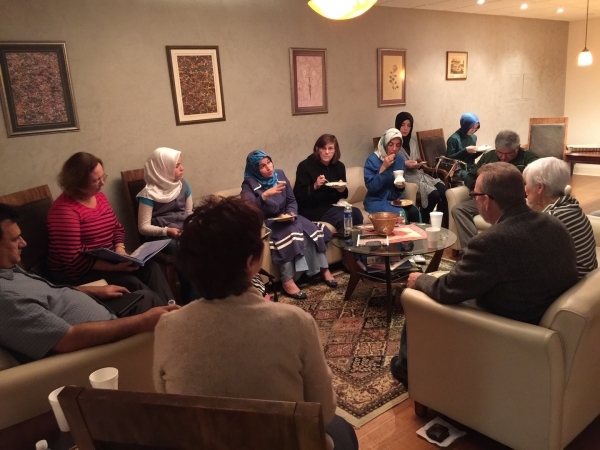 On Tuesday, January 27th, the “Around the Fountain” discussion series addressed the Fountain Magazine article called “The Grand Mosque of Paris.” The article illustrates the story of how Muslims of Paris saved Jews from Nazi Germany in the 1940s. The mosque provided shelter, care, and guidance to the Jews that had escaped to Paris from the Nazi rule in Germany. This simplified book briefly summarizes these events and how the positive relationships between Muslims and Jews escalated. Even though it may be a children’s book, the story itself sets an example of harmony and peace in which everyone can learn and benefit from. By reading and discussing this story especially after the recent attack in Paris, one can recalculate his or her understanding of Islam. The speaker, (insert information about the speaker), summarized the extended history of the events that took place in the Grand Mosque. She emphasized the social behavioral importance of children’s books on the child’s psychology and how these books shape their personalities. Respectively, these types of books initiate future generations to be more open minded towards other beliefs and cultures. One participant argued that the article was too factual and simply a general overview of the book and did not highlight or assert the true meaning and morality of the story. Consequently, the discussion inclined towards the connotation of the book rather than its denotation. Such an interaction between the Muslims and Jews showed how different religions and cultures can co-exist. Therefore, such coexistent societies can promote peace and tolerance. It was heartbreaking to share that this act of interfaith that was going on during this discussion would not be put on the news as easily as those events such as the Paris attack. Additionally, another participant shared her custom made butterfly necklace that was put together with various stones and metals. This specific necklace symbolized a butterfly that would acquire the colors of other butterflies in the places it would travel to so that it can avoid being foreign (or alluring) to its predators and adapt to the culture surrounding it. People, in a sense, shall benefit from adapting to their surrounding belief and cultural systems so that we can understand, get to know each other, and co-exist at a more intellectual level. The discussion concluded that we should be respectful towards different cultures and religions. This book, by depicting the relationship between Jewish and Muslim people, helps us understand ways to make this tolerance circumvolve within our communities.